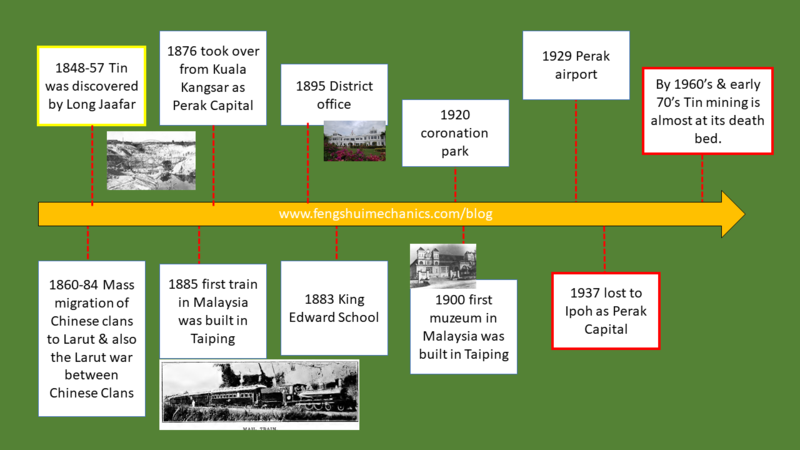 In short, Taiping glory started way back in the around 1850 but ended around 1940. Then the Second World War broke out and since then the Tin industry was still prospering and it tailed towards the 60’s. From the time line, you can see the town actual high growth was between 1880-1920 and that is in the Period of One till Four. Period One started from 1864 while Period 4 ended in 1953. Soon after the expiry of Period 4, the world market for Tin follow suit and ended in around the late 60s. Period refers here to a time frame. Each time frame or Period termed as Yun 运 in the study of San Yuan system of Feng Shui. Each Yun is varies between 18 to 27 years in the Liu Fa system. The violation of the Golden Dragon theory after Period 4, has caused the downfall of this once promising town. Till today Taiping and Kamunting has changed as has Malaysia in the past decade. Unfortunately, not all for the better. The un-monitored expansion to the town will undoubtedly effect its position as a heritage town. There is so much to conserve in this old town and not much attention has been given to it. Defacing old shop house facade with gaudy, neon signboards, cheap renovation materials, tearing down old to be replaced by garish non-discrete buildings – that’s what is done best in Malaysia . What’s also worrying is that when facade are intact, the beauty of the interior are gutted to be replaced by grotesque cheap paneling and shoddy interior refurbishment. My friend’s feedback is that Taiping until today is still a slow town without much major economic activities. Most youngsters are living out of the town due to low job prospects. Yet its rich past still leaves mark of a once prosperous town and talents. Qoute from Thestar “Taiping Heritage Society president Yeap Thean Eng, 52, said development in the Taiping town centre famous for the iconic Taiping Lake Gardens, Bukit Larut and Taiping Zoo, had been mostly stagnant for the past 20 years. “There has not been much growth in Taiping ever since a period of flourishing in the 1960s and 1970s after we gained Independence. “This has resulted in a migration of young adults to bigger cities in search of work as there is practically no work opportunities for young professionals here,” he said. Instead, Yeap pointed out that development was more prevalent in Kamunting. Perhaps to a Feng Shui skeptics, this is just another story but those who knows the real knowledge of San Yuan Land form Feng Shui, will certainly be convinced that Feng Shui had it’s hand dealt on this town after all, Feng Shui is the study of Land Formations or the Earth’s Energy Map. if you like this article, feel free to give it a Like or Share it.